Earlier this year I wrote about a diffuse band of gamma rays coming from regions above and below the Milky Way. The regions spanned about 25,000 light years above and below the galactic plane, and are thought to have formed from an active period of our galaxy’s supermassive black hole about 2 million years ago. While we could determine the size of these regions from their x-ray and gamma ray emissions, it has been difficult to determine their motion. 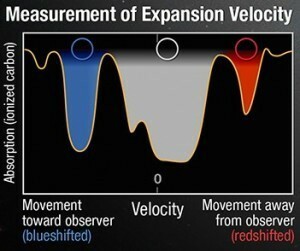 But yesterday at the American Astronomical Society Meeting, new results from the Hubble telescope are measuring the motion of these regions using an interesting trick. 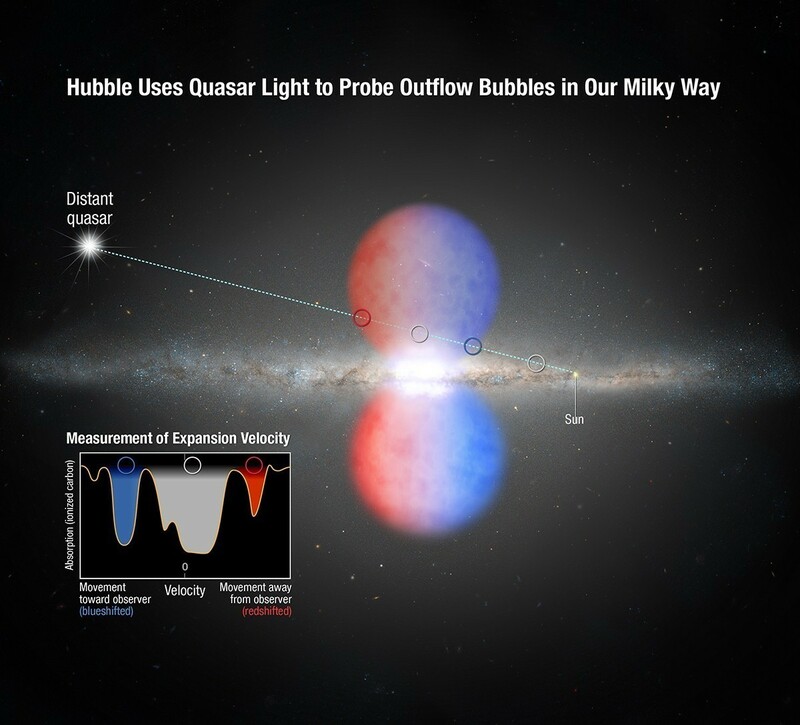 The team looked at ultraviolet light from a distant quasar. The light from this particular quasar passes through the gamma ray bubble before reaching us, and so interacts with the material there. By looking at the spectrum of this light, you can see dark lines where the intervening material absorbs light at particular frequencies. By comparing these absorption lines with ones from materials on Earth we can determine what the material is made of. But you can also determine the speed at which the material is moving due to its Doppler shift. Normally when we talk about the Doppler effect, it is a shift in the wavelength of light toward the red or blue due to the motion of the light source. But in this case, the material in the region relative to the quasar, and the light it “sees” is redshifted or blueshifted due to its motion. This means if the material is moving toward us the absorption lines are blueshifted, and if they are moving away from us they’re redshifted. Since motion is relative, we can calculate the speed of the material by the shift of its absorption lines. What the team found was that the material is streaming away from galactic center at about 800,000 m/s. That’s fast, but not quite active black hole fast. So it seems like these lobes of material may be the result of a burst of star production in the central region of the Milky Way. To know for sure we’ll need a more detailed analysis of material motion in this region. Fortunately there are about two dozen quasars that happen to have a line of sight through the region. So more backlighting will likely illuminate this mystery.